Los Angeles Chargers kicker Younghoe Koo is no stranger to adapting to new situations. After growing up in South Korea, Koo found himself attending sixth grade in New Jersey, living with his mother who had moved to the U.S. two years prior to pursue a career in nursing while his father stayed in Seoul as a university professor. 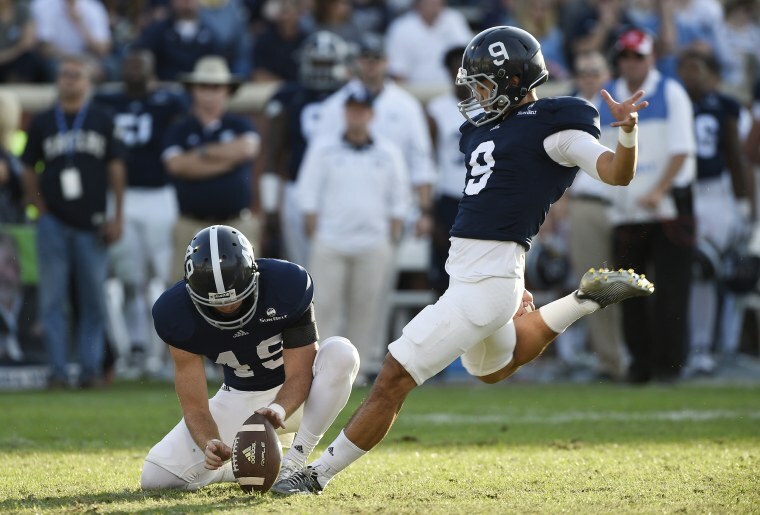 After that initial adjustment, Koo would go through a second transition when he spent his college years nearly 800 miles south as a kicker for Georgia Southern University. "I talked to my parents, and I think culturally we're on a different level of thinking because I just completely adapted to American culture now." Compared to those two culture shocks, moving across the country to California in hopes of making the cut as an undrafted free agent with the Chargers hardly fazes Koo. One of Koo’s brightest college highlights is a trick-shot video he uploaded back in 2016 where he executed a field goal and a backflip in one fluid motion to ascend the ranks of internet notoriety. For many, that video eclipsed a college resume where Koo converted 19 field goals in 20 tries in his final season en route to earning a third team All-American nod and being named a finalist for the Lou Groza Award given to the nation’s top collegiate kicker. But Koo’s accolades did not slip past the Chargers scouting office. And while he is now surrounded by a litany of seasoned veterans during each day of training camp, Koo doesn’t see any reason to conduct himself any different from his peers. Koo’s philosophy can be traced back to his experience in overcoming his shyness and the language barrier after moving to New Jersey, he said. “I [had] a lot of mixed emotions,” Koo said about his first day in middle school. “Scared obviously, because [I] didn’t know the language, I couldn't speak English then, and I didn't know then but going through it definitely the culture was different." Before long, Koo joined the football team, where game days and the subsequent team hang-outs were welcome chances to socialize. Soon after, Koo mustered the courage to string together a sentence (“I’m bored all the time.”) to his teammates to extend their friendship off the gridiron. Should Koo make the 53-man roster for the Chargers, he will become just the fourth South Korean-born player to compete in the NFL, according to the team. The significance of that fact is not lost on Koo. Before entering high school, Koo had to decide between continuing on with soccer or football. The popularity of football was lost on Koo’s father, who saw Koo as “just kicking a football,” Koo said. It wasn’t until a talk with Koo’s middle school coach and some subsequent research that his father advised his son to stay on the gridiron. Be it football or soccer however, the end goal of becoming a professional athlete was always the same for Koo. Koo explained that while students are encouraged to pursue extracurricular activities in addition to their studies in America, South Korean youth did not have that luxury. Due to the intensity of the school work in South Korea, students typically had to devote the majority of their time to their studies, and had little time for much else. As a result of learning to balance school and sports, Koo believes that he is a more well-rounded person. "[College] taught me a lot, I think it's important to get involved, because in college too, it was the student-athlete, so it was a fulltime job really,” he said. “You know, balancing school work, and you got practice and workouts in the morning and all that stuff, they really teach you important life lessons really. I think it's really important, I love it, I think I'm more Americanized than ever. I talked to my parents, and I think culturally we're on a different level of thinking because I just completely adapted to American culture now." Koo’s varied life experiences are not just reflected in his mindset, but also his speech. Occasionally, a Southern twang from his time in Southern Georgia can be detected on top of the New Jersey English he picked up from his friends, he said. "I think it's a mixture of everything, people tell me they don't know what I am," Ko said. "My friends taught me how to speak English at first, so I got the foundation from New Jersey, and then I went to South Georgia where I picked up ‘yes ma'am’, ‘no ma'am’, and all this stuff, and then now I'm in California, so who knows I might pick up some more new things."